In my first few pinewood derbies I had no concept of setting a balance point (also known as COG or CG). I knew that the car needed to weigh five ounces, so I added weight to the middle of the car and raced. We had mixed results (most everyone else didn’t know what they were doing either). But there was one family who had very fast cars. From that Dad, I learned about rear-weighting (and about using a quality graphite). So after that we started rear-weighting the cars. When I wrote the first few editions of our “Speed to the Finish” booklet (for free distribution at our local club – not for sale) I didn’t even mention a balance point. But in the first edition that went on sale, I gave a range of 3/4 to 1-1/4 inches as the target balance point. Is/was a 1-1/4 inch balance point the best position? Has anything changed to cause us to rethink the best balance point? Let’s take a deeper look. The balance point of a pinewood derby car can be easily located as follows: (1) set a COG Stand (or a ruler on its long edge) on a table and (2) lay the car (with wheels and axles in place) on the device as shown in Figure 1. Move the car forward or backward until it balances on the ruler. The balance point is the distance from the center of the rear axle to the point at which the car balances. The balance point directly affects the stability of the car. If a car has a balance point that is too aggressive for the track, the car will generally be very fast on the hill, but will become unstable on the flat portion of the track and will exhibit a rapid left-right motion known as the “death rattle”. To correct the instability, either Rail- Riding1 alignment must be implemented (or increased), or the balance point must be moved forward. Likely, the 1-1/4 inch balance point standard came from repeated posting of this number on web sites and in speed tip booklets. At the time when this number became a standard (the year 2000 or earlier) most tracks were made of wood and were not as smooth and precise as modern tracks. So the 1-1/4 number was aggressive enough to provide good performance, but conservative enough to provide stability on the vast majority of tracks. Another factor to consider is that tungsten was not readily available for car weighting until about 2003, so making a car with a more aggressive balance point was a challenge for most car builders. So, all things considered, at the time the 1-1/4 inch balance point was a good target number for the vast majority of car builders. But then, as always, technology changed and pinewood derby racing reaped some of the benefits. First, aluminum tracks came on the market, followed quickly by tungsten weight. Now, cars could be more easily rear-weighted, and smooth tracks were available to improve stability. Finally, the Rail-Riding alignment method was introduced to the pinewood derby community, which provided increased stability for cars running with aggressive balance points. So, we are now at a time when the 1-1/4 inch standard is a bit dated. When people ask, I now give the target balance point numbers listed below. Please recognize that these numbers are for people that generally do not have tracks to test on and have one shot at racing. Certainly, you can be more aggressive if you have access to a track, and time to fine tune the car. There are other factors that affect these target numbers. For example, tracks of 50 feet or longer, and very rough tracks require a less aggressive balance point. But if the track is reasonably smooth and of a standard length, these target balance point numbers work well for the majority of car builders. Certainly there are a lot of factors that affect the positioning of the balance point. However, I hope that this article provides some food for thought, and helps reset the standard for setting the balance point. But I am sure that I will keep getting calls from folks stating that they “set the balance point of their car to 1-1/4 inches, which is the recommended position”. Let’s kick off the new season with some very unique cars that were submitted at the end of last season. 2009 was the last year for my son to compete in the Pinewood Derby. He has done well in the past with a variety of cars, but for his last year, he wanted to build a pickup truck. We bought a ’56 Ford Step side die cast car to copy and scratch built from there. Since we only had two weeks to get them completed, it was an ambitious project. In the past, I have built several exhibition cars while my son built more conventional cars. Using the profile of the die cast car, we started with a sketch of the top and side view of the car using the Boy Scout wheelbase and overall dimensional requirements. 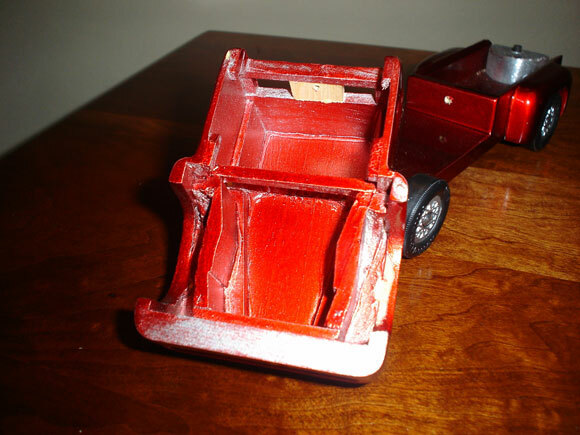 Since this project required a hollow body and woodcarving skills, we each built a truck with me working step by step ahead of my son while he followed/copied my work on his truck. The original Pinewood block was cut down to 3/8 inch thick and thin pine stock was added to form the bed and truck cab. The panels were carved and sanded to final shape followed by many coats of primer with sanding between. Since the colors are transparent, a silver base coat was used under the transparent top coats. The hollow lead tanks in the rear of the beds are formed from stick on wheel weights and final weight adjustment was made using lead shot. A wood screw between the truck bed and the cab secures the cab to the chassis. Although the truck didn’t do well in the race due to aerodynamic considerations, for the first time my son has taken an interest in woodcarving, so I consider it a huge success. His truck also won a trophy for the Most Unique design, although the judges were probably not aware of the hollow cab and woodcarving required for the build. The first photo shows the cab off and the second shows the underside of the cab and how it was scratch built from pieces of pine before final shaping and painting. 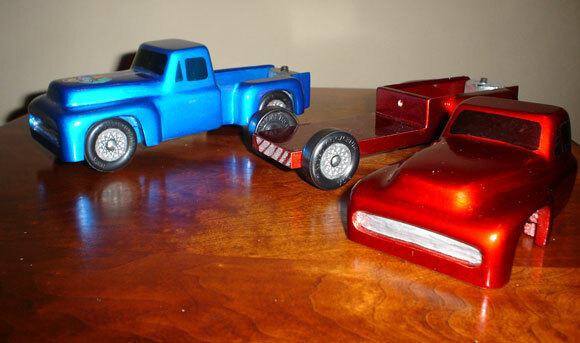 My son’s truck is blue and mine is red. 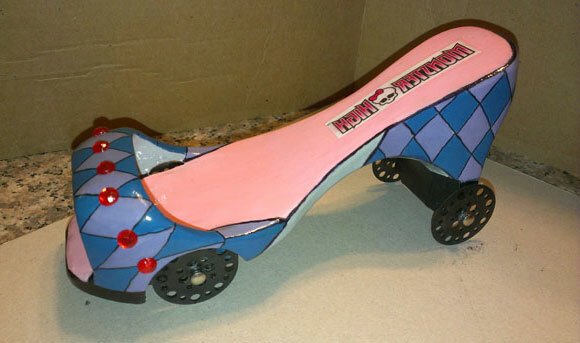 This Monster High-heeled Shoe car was built for fun for my daughter Addison to beat all the boys at her brother’s derby on race day. The speedy razor wheels gave this car a nice boost. The unique design got lots of attention. 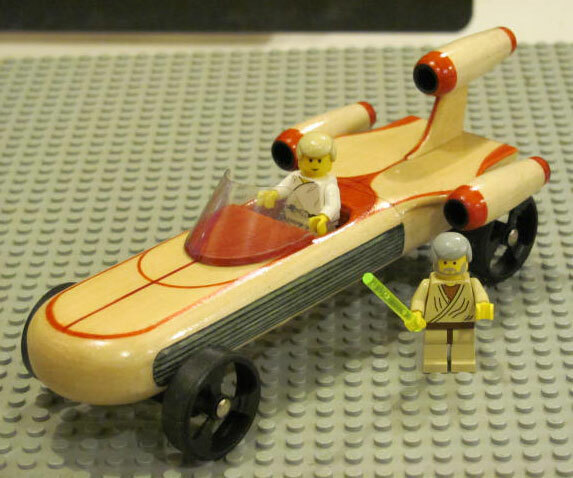 While sorting through my adult son’s Legos I found the instructions for a Lego version of Luke Skywalker’s Landspeeder. After consulting with Obi Wan and Luke we decided my speeder could only have one seat, so it wouldn’t interfere with the cars in the other lanes. Obi Wan found a guy that could machine the three-spoke wheels. What is the difference in speed and looks between the Pro- Stock(4080) and Ultralight(4070) wheels? I always get the 4080 wheels but I’m tired of losing at council. I’m afraid someone will call me out if I use the 4070 wheels, but they don’t measure the wheels. First, I would carefully check your rules, and then use the fastest legal wheels. I don’t recommend breaking the rules in an attempt to gain an advantage. But to answer your questions the 4070 wheels are partially weight-reduced, so they are faster than the 4080 wheels. Typically they provide one or two inches of advantage at the finish line. At a glance the 4070 wheels are not distinguishable from the 4080 wheels, but they can be identified by placing your finger up under the tread. The tread is thinner (on the underside) than on the 4080 wheels. My son’s car ran pretty consistent in the first grouping (4 heats), but then ran more slowly in the finals. Any ideas as to why? We polished and grooved the axles, and did all the graphite prep/break-in suggested with Max-V-Lube. Were the finals ran on the same track? Were the elapsed times of the final heats slower than the elapsed time of the preliminary heats? If the car truly slowed down in the finals (as proven by elapsed time), then the car could have been damaged during handling and racing (wheel alignment knocked askew, wheel damaged, axle bent, etc). Possibly the lube could have started to wear out. But lube wear-out is unlikely unless the car had run 15+ heats since it was lubed. If the heat times were not really slower in the finals (event was run on a different track, or no times are available to compare), then either the other cars got faster, or your car just appeared slower because it was racing against the fastest cars.